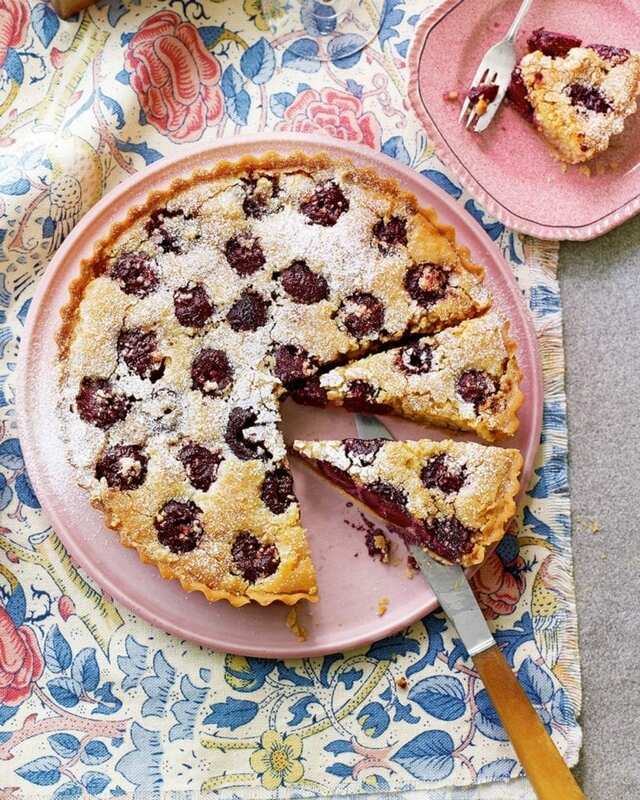 A gorgeously rich frangipane tart bursting with juicy cherries and encased in a crumbly shortcrust case. Try Debbie Major’s delightful dessert, or, try our similar individual cherry and almond tarts. For the pastry, sift the flour, icing sugar and a pinch of salt into a food processor. Add the butter and whizz until the mixture looks like fine breadcrumbs (or rub the butter into the flour in a mixing bowl, then stir in the icing sugar). In a small bowl beat the egg yolk with the cold water. Tip the crumbs into a mixing bowl, add the yolk and bring together into a ball. Turn out onto a floured surface and knead briefly until smooth. Chill for 30 minutes, then roll out thinly on a lightly floured surface and use to line the flan tin. Heat the oven to 200°C/180°C fan/gas 6 with a baking sheet on the middle shelf. Line the pastry case with foil and a thin layer of ceramic baking beans or uncooked rice and bake for 15 minutes or until the edges are biscuit-coloured. Remove the foil and beans/rice and bake for a further 5-7 minutes until the base of the case is crisp and golden brown. Remove and set aside. Turn the oven down to 150°C/130°C fan/gas 3. For the filling, cream the butter and sugar in a mixing bowl until fluffy. Put the almonds into the (clean) bowl of the food processor and process until finely ground (see tip). Add the butter and sugar mixture and blend, then whizz in the eggs, one at a time. Arrange the cherries over the base of the pastry case. Dollop the filling over the top of the fruit and spread out evenly, skimming the tops of the cherries with a spatula so they just show through the mixture. Bake for 1 hour 15 minutes, turning the tin during baking so it cooks evenly, until richly golden brown and cooked through. Serve warm or at room temperature, dusted with icing sugar and cut into wedges. If you don’t have a food processor use ready-ground almonds and mix the filling by hand in a mixing bowl.